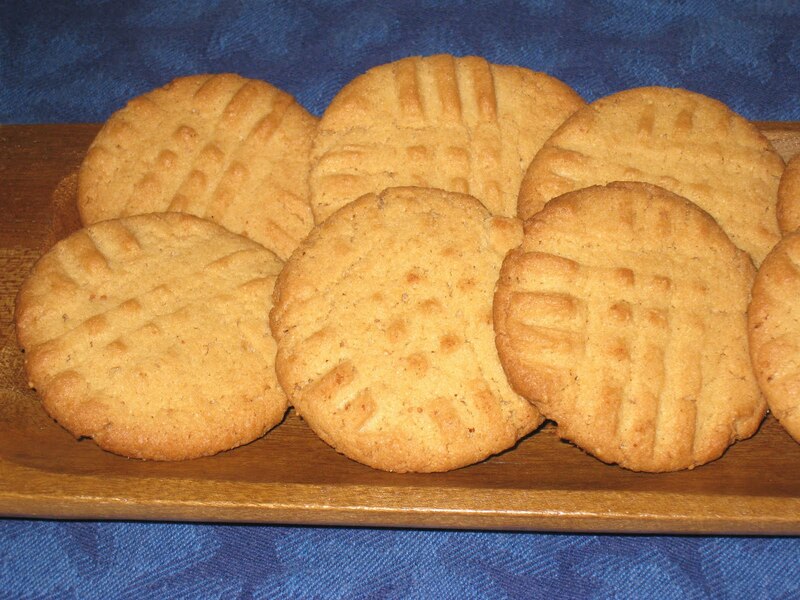 This peanut butter cookie recipe is another old family recipe. It is one of those cookies that I would always forget about, and then something would remind me of them and I would make a batch and they were so good I would wonder why I didn't make them more often, and then I'd forget all about them again for more than a few years. More recently, I had a different kind of dilemma with them. The original recipe called for shortening, and I don't use shortening any more. I have experimented with lard with good results on the savory side, but there's just a little too much pig to my taste for use with sweets. I generally don't have a problem substituting butter for shortening, but for some reason I wasn't sure how well it would work with the peanut butter cookies. I think because the peanut butter also adds fat to the dough, it might be too much for butter alone to handle. But I have been doing my Christmas baking and was looking for something new to add to the rotation. Much as my friends love the things I do make around the holidays, I get tired of making the same things. This year I have been experimenting, and I thought it would be a good time to see exactly what a difference using butter instead of shortening would make. As it turned out the difference was negligible. They were crispy, sweet, and full of peanut butter flavor, although I forgot that even though I prefer creamy peanut butter as a rule, for peanut butter cookies crunchy is actually better. That aside, I think I may have liked these even better with the butter. The proportions of this recipe worked out well for me to make a half batch for my test, which was quick and easy. And four dozen or so cookies is nothing to sneeze at. I took some to work and some to my knitting friends and still had enough to enjoy a few at home without making me feel too guilty. Combine the brown and white sugars and mix well. Sift together the flour, baking soda and salt and set aside. Cream the butter. Add the sugar and cream well, until the mixture is light and fluffy. Add the beaten eggs and the vanilla and mix it together. Incorporate the flour just until the dough begins to come together, then add the peanut butter and make sure it is fully blended into the dough. Roll the dough into balls the size of walnuts. Place one inch apart on an ungreased cookie sheet. Press each ball on one side with the tines of a fork, then press the tines over each cookie at a right angle to the previous lines to make a criss-cross effect. Bake at 400 deg. F. for about 7 minutes, until they are just beginning to brown. Be careful not to let them burn. Check them after 5 minutes. Makes approximately 10 dozen, depending on size.